Like America as a whole, King County has become a much more diverse place. It’s remarkable to think that in 1990 — not all that long ago — the county’s population was close to 85 percent white. Shortly after that, though, the county began to diversify rapidly, first in the South End. By 2010, in a number of cities south of Seattle, people of color made up the majority: Kent, Renton, SeaTac and Tukwila. This decade, it’s the Eastside’s turn. Bellevue became the county’s most recent city where people of color make up at least half the population, which I reported last year. And census data released last week show that we should be adding Redmond to the list very soon. Just like in neighboring Bellevue, the pace of diversification has been incredibly fast in this city of more than 60,000. 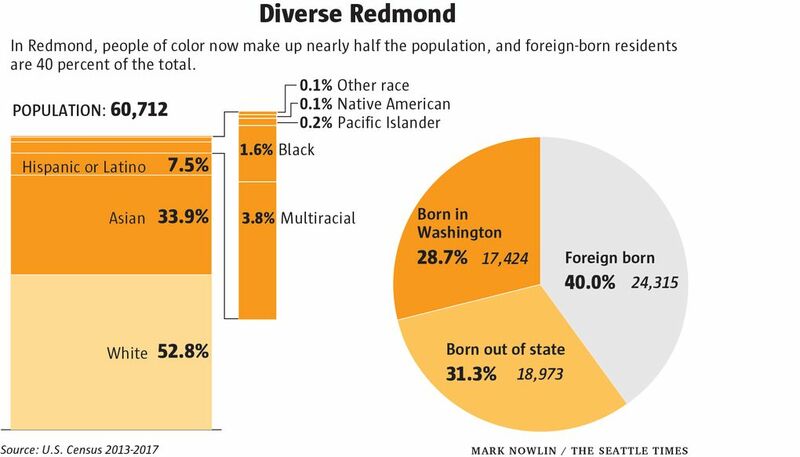 The new data, which averages the five-year period from 2013 to 2017, show that people of color make up 47 percent of Redmond’s population — that’s a jump of 10 percentage points since the start of the decade. Demographic changes rarely transpire so quickly, but Redmond is also one of the state’s fastest-growing cities. From 2010 to 2017, its population increased by 18 percent, which is nearly on par with Seattle’s pace of growth. Even so, Redmond’s white population, which stands at around 32,000, didn’t grow at all in this period — if anything, it shrank a bit. Meanwhile, the Asian population increased by nearly 70 percent, and there were also big jumps in the multiracial and Latino populations. People of Asian descent make up one-third of Redmond’s population, which is similar to Bellevue. 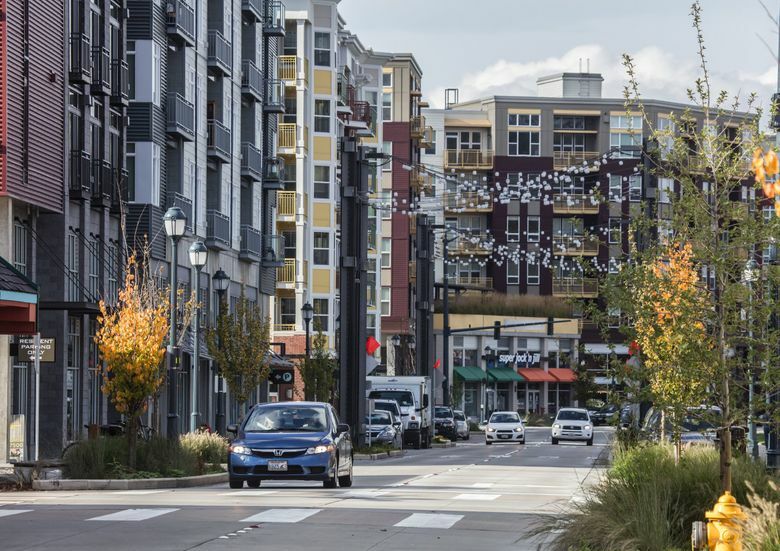 While Seattle has also experienced tremendous growth and change this decade, the city has not diversified nearly as fast as Redmond or other suburban communities. Seattle is diversifying, though it’s been slower, and happening in fits and starts. In 2017, the racial and ethnic composition of the city was unchanged from the year before. And in fact, in one year this decade — 2013 — census data showed Seattle actually got whiter. As of 2017, people of color made up about 36 percent of the city’s population, an increase of two percentage points since 2010. In the rest of King County, not including Seattle, people of color grew by six points in that period, and now make up 42 percent of the total population. Decades ago, Seattle was actually more diverse than the rest of the county. But as the city gentrified, communities of color starting leaving, and many settled in the more affordable suburban areas just south of the city. That’s one of the reasons that the South End grew much more diverse while Seattle didn’t. The Eastside is a different story. Nobody is moving there for affordability. Redmond is an affluent community with homes averaging $850,000. No, the main driver behind the move to greater diversity on the Eastside is tech. 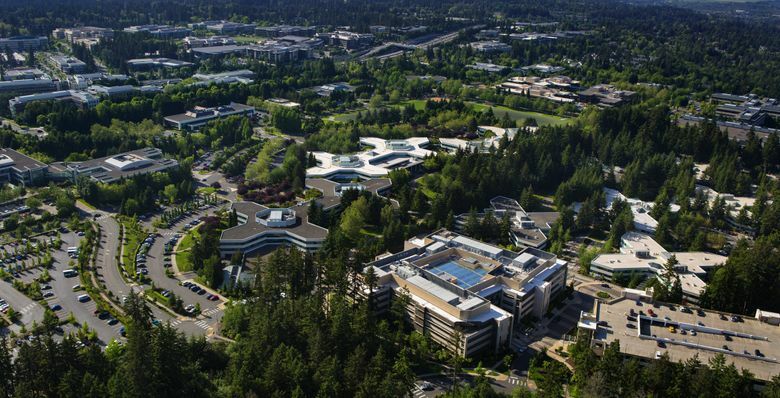 “The technology companies, Nintendo and Microsoft in particular, have recruited talent from all over the world, and that’s what brought Redmond’s and Bellevue’s diversity,” said Marchione. There’s some degree of irony there, because the tech industry is often singled out for its lack of diversity. It’s true that there is a significant gender imbalance in tech jobs, and that black and Latino workers are underrepresented compared with their share of the population. 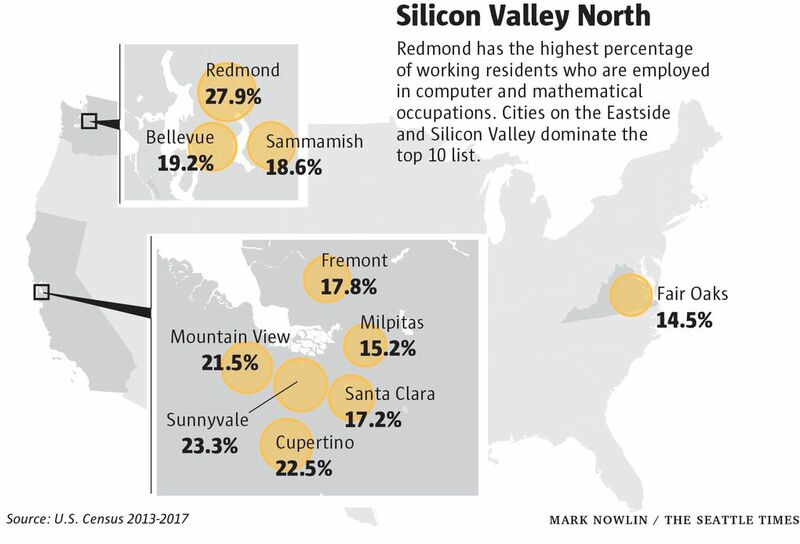 About 28 percent of Redmond’s residents who are employed work in computer and mathematical fields, according to the census. That ranks No. 1 among all U.S. cities with at least 20,000 working residents, beating out Sunnyvale and Cupertino and all those other places that Silicon Valley tech giants call home. The tech industry is also heavily reliant on foreign-born labor, and more than half of software developers in our metro area were born outside the U.S. In both Redmond and Bellevue, about 40 percent of the population is foreign born, more than twice as high as Seattle. Marchione says for all the growth and change, things have been going smoothly in Redmond. The city adopted a cultural-inclusiveness motion this year, and like Bellevue, looks at its diversity as an asset. The city provides diversity training for its employees, and has translators on call. “The goal is to make government access available to everyone. It shouldn’t be limited by your background,” Marchione said. “Our approach is to be a blended community, to understand each other’s cultures, religions, differences.